My son told me last week that he’d like to go to Christmas Eve worship with me, and even knew the schedule for services. 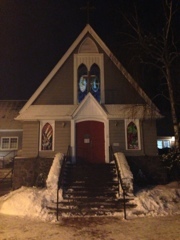 So after a lively and delicious dinner at the home of my ex husband and his wife, after the grandsons were tucked into bed, he and I drove through the snow to celebrate Christmas at the church where I had attended Sunday worship yesterday. It was the first Christmas Eve in twenty years that I had not been responsible for worship for hundreds of people. I was ready to experience Christmas on the other side of the altar. It was sweet. There were maybe seventy people gathered at 10.30 PM to celebrate the birth of Jesus. The worship was simple–no sung prayers or incense. However the liturgy was done very well, and a nice touch was Christmas lights strung from the ceiling of the nave. They gave us a canopy of light when the other lights were dimmed for the singing of Silent Night, kneeling, after Communion, just as my parish home would have knelt and sang hours earlier. As I received Communion, the choir and congregation sang Away in a Manger. Only hours earlier I had sung that very hymn to my grandson after putting him to bed. Returning from Communion, I knew that this was truly my best Christmas ever. In the morning my daughter will join us for breakfast and the tree. Gift upon gift upon gift being with all my children and grandchildren under one roof. God has already answered yes.